We are offering a special discount on the Podcasting Bundle when purchasing enter the coupon code cyberdeal and receive a toal of $ 20.00 off of RecordForAll and FeedForAll the two applications that make up Podcasting Bundle. As always there is Free Shipping on all FeedForAll orders that include a CD ROM. Only $ 49.95 with coupon code! FeedForAll - Desktop software to create RSS feeds, podcasts, and iTunes compatible podcasts. 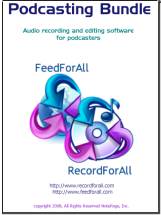 RecordForAll - Desktop audio recording and editing software designed specifically for podcasters. Step by step tutorial to create an iTunes compatible podcast. Creating a Podcast to publish on your web site or on iTunes Music Store is as simple as 1,2,3. Follow this step-by-step tutorial with clear and precise guidelines. Remember that in addition to audio, there are 2 elements for publishing a Podcast on iTunes Music Store: iTunes specified artwork and an RSS Feed including iTunes Specific Tags. Todd Cochrane is again running a 24 hour podcast. The 2008 24 hour Podcast will kickoff on November 22nd at 11am EST and run a full 24 hours non-stop.This years 24 hour Podcast event is to raise money for disabled veterans, they are hoping to raise $3000.00 this year. Audio editing and recording software. Easily record, and edit audio files for podcasts with software. There is a free trial available for download. This is slightly outdated but still contains some really valuable information for those who have an iPod but struggle with deploying some of the more complex functions. Check out the iPod Tutorial. Here is a great list of mime types for those creating podcasts with different kinds of files in the enclosure field. It is important that if you are creating a podcast or video feed you will need to include the appropriate mime type. Many people assume that podcasting is all about audio and fail to acknowledge the writing behind the show. Skilled communicators understand the type of planning required in order to pull off a clean final product. Struggling with the nuances of your iPod? Check out this iPod tutorial. Startup digital advertising and technology firm VoloMedia, which says it can deliver advertising and measure audience traffic within content that is downloaded to portable devices, has launched a new version of its plug-in product that is compatible with Apples iTunes. The company, which currently works with publishers MSNBC, Fox News and Public Radio International, says it has an answer to a problem that has stalled the growth of podcast advertising -- namely, how do you track what happens to digital content when it's no longer connected to the Internet? VoloMedia, formerly the podcast advertising company PodBridge, has created downloadable software that is designed to measure audience activity, such as how many people listen to a particular podcast.